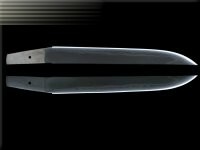 Base material for the Tanto blade is carbon steel CK74 / 1075, thickness 4 mm. 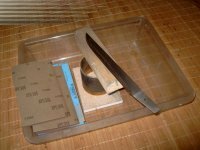 The blank is shaped with an angle grinder and files. The edge should be 1 - 2 mm before hardening. 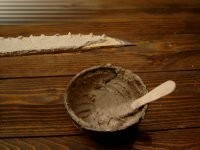 The blade is covered with a clay mixture (fireclay mortar) - only the edge and back are left more or less uncovered. Thickness of coating is about 3 - 4 mm. 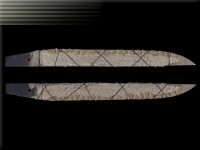 Please note that the blade will bend, if the back is also covered with clay and therefore not hardened. 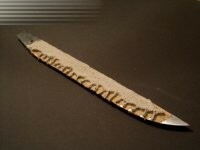 Is the back hardened indeed, the blade will not bend - a wanted curvature should be done during early shaping. 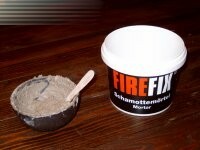 The clay cover should by dryed and fixed with wire to avoid flaking off during heating and quenching. 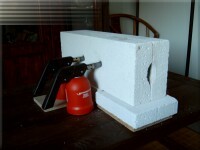 The blade is heated is a furnace chamber made from Ytong bricks (gas concrete) fired by four torch lamps. The right temperature is reached when the steel becomes non-magnetic. The blade shall be quenched quickly in warm water (>= 40°C). Before the steel becomes cold, it should be tempered in the kitchens oven for about 1-2 houres at 200°C to reduce damaging stress arose during quenching. 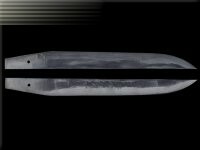 The blade can be shaped and polished. It was grind with a electric grinding wheel (avoid high temperatures! ), abrassive papers and files at the tang. 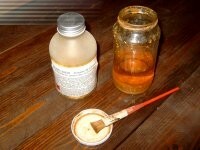 No scratches should be visible but also no mirrior finish. 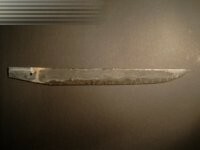 The hamon can be made visible by etching the steel surface with vingar, FeCl3 etc. This methode is not traditional and shall not be applied to real japanese blades, but it works good to make the line visible without an extensive polish.